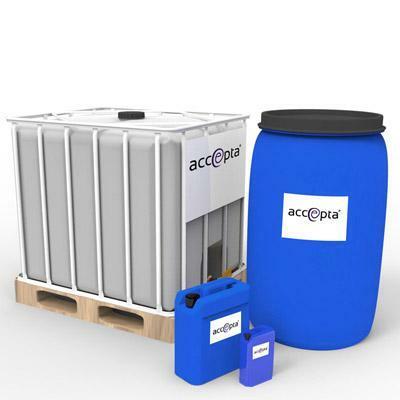 Accepta 2319 is a high performance, blended liquid boiler water treatment based on organic tannins, polymer sludge conditioners and alkali that is scientifically formulated for the treatment of steam boilers and low pressure hot water systems. Accepta 2319 can be used with softened or moderately hard make-up, and in many instances provides a complete balanced treatment by itself. However it can be used with other widely used conjunctional treatments to provide phosphate control and condensate system protection. Accepta 2319 controls corrosion by the dual mechanism of oxygen scavenging and the formationof a corrosion resistant tannate film. Accepta 2319 prevents scale formation by converting residual hardness salts to a mobile non-adherent sludge that can be removed by blow-down. Accepta 2319 should be dosed initially at 1:1000, based on the system volume. The on-going dosages should be made to maintain a tannin reserve of 12-20, and the appropriate pH and alkalinity residuals. The actual product dosage required depends on such variables as make-up water temperature, hardness and TDS.